Inter State Oil Carrier Ltd. is in portfolio of Subramanian P. He is one of the top investors in India. The company belongs to Transport sector. As per the Company website it is in transport business of bulk liquid and gas transport across PAN India. It is widely acknowledged as a leading transporter of bulk liquids in India today with strong presence in the East to West , East to North and East to South Corridors and vice versa . Our versatile and dedicated bulk liquid carrier fleet includes single and multi-compartment tankers, SS Tankers, and the newly introduced state-of-the-art integrated tanker trailers with high end facilities. It is using new approaches to improve performance. Fast tag enabled tankers, Insulated tanker and 14 wheeler tanker are some of the initiatives taken by Company. It is also planning to add new corridors into coverage area. That will help it become Pan India company in true sense. Some of the Clients are Bharat Petroleum, Fair Chem, Berger Paints and Adani wilmar. The long term chart is not very impressive. Investors have not lost money but they have not made good fortune as well. The stock gave only 2 times return in absolute terms. It never really got started and delivered. Initial 3 to 4 years were good when it gave around 6 times return in short span of time. 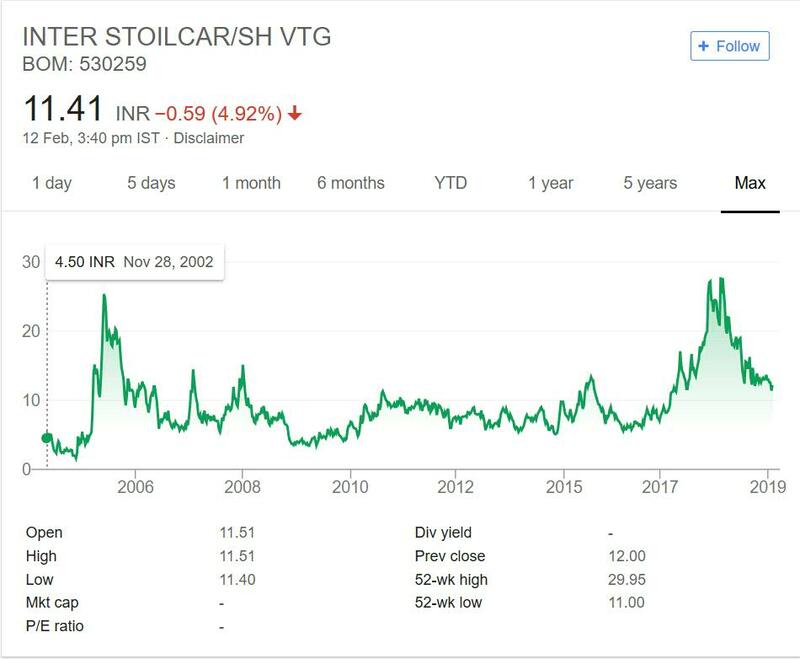 But from 2006 to 2017 (approx 11 years) it hovered around 10 INR mark. Sometimes it moved up and sometimes it moved down giving impression of consolidation and stock not really zoomed part that 10 INR mark. It jumped after that long consolidation to 30 mark but again was beaten down back to 15 odd levels. Inter State Oil Carrier Limited is in transport sector. It is land transport based Company. Fuel prices have good impact on profitability. Second important thing is regular contract to move things around from one place to other. Transport is capital and labor intensive business. It is still largely dominated by unorganized sector. You will see too many transport offices and local players in every major city. Railways and newly proposed water based transport are major competitors to land based transport. These two are cheaper and poses cost advantage to land transport. Due to these reasons I am not too convinced in the sector. It is a safe sector but will not grow at fast rate to give you healthy return.It may under perform or remain stable depending on how well river transport works out.In case you are interested then you can track the company by adding it to your stock watch list. That way you can keep close eye on the Company.